Another sweet hound has left our FFGR, Inc. family. Several weeks ago, Dana Rinehart called me to tell me that her precious hound, John, had just been diagnosed with the dreaded osteo. John was not quite seven years old. She and her husband David adopted John from our group several years ago. According to Dana, his cancer was caught relatively early. At the time she did not know what to do but was faced with the hard decision about whether to have John go through surgery for an amputation or to do pain management and give him what time was left. Like everyone who is faced with a difficult decision to make regarding what would be best for our hounds, she struggled with the decision and decided to have the amputation done. However, the morning it was scheduled she could not go through with it. She made a change in her decision a few days later when John went through a painful night. The surgery was done and John went into the recovery room. The surgery was considered a success. However, a short time later, John died of a heart problem. 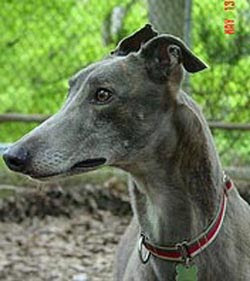 John was a really beautiful blue brindle boy and he had a very gentle and quiet nature. I know he had a wonderful home and it was very obvious that he was greatly loved and cherished. We are so sorry for Dana and her family and we understand their deep sense of loss. The Rineharts gave John the gift of their love. That is all that any greyhound deserves. Run free at the bridge John. You were greatly loved and will always be remembered.